Hugo Harrison Jackson was a science teacher, born in Cheshire. He served in the Friends Ambulance Unit in Belgium and then France from 1915-1918. For some time he organised stores but pressed to be allowed to go out with the ambulances. 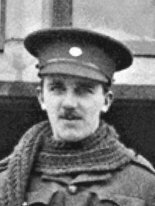 While moving the sick and injured in Picardy in May 1918, his ambulance became caught in a rapidly shifting battlefront and was hit by a shell. The driver, Norman Gripper, was killed outright and Hugo did not survive the journey to the dressings station. He died on 27th May 1918 in France and is buried in the British cemetery at Vailly-sur-Aisne. Address: 1, West Grove, Kendal.